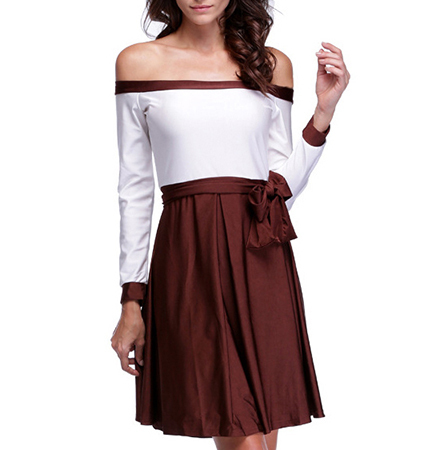 This is an elegant off shoulder mini dress that is presented in a lovely shade of deep wine and white. The bodice is all white with wine colored trim at the neckline. The neckline stretches down over the arms, completely baring the shoulders. The bodice is closely fitted and has long sleeves. The same deep wine colored trim appears at the wrists. The waist is defined by a wine colored band with a decorative bow detail on one side. The skirt is short and full, with the hemline ending well above the knee. This dress is machine washable in warm water and may be tumbled dry on a low temperature setting. It is available for purchase in sizes Small, Medium and Large.